Let me just say one thing: you’re about to have a new favorite band. 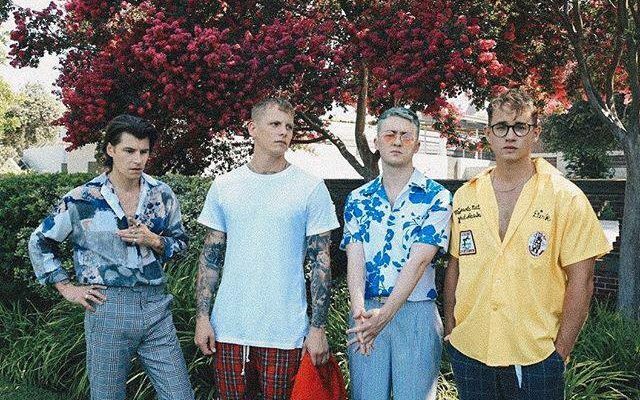 Long time fans of former band, Rixton, may recognize the guys of Push Baby but let me set you straight, this is not Rixton. Forget everything you thought you knew and dive into the whirlwind that is Push Baby’s debut. Their first single, “Mama’s House,” was released today along with the music video complete with neon colors, out-of-this-world creatures, Scooter Braun’s head (don’t ask), and a flaming portable toilet. It’s a ride from start to finish to say the least. Lead singer, Jake Roche, shows a confidence and artistry we’ve not quite seen before. At the risk of sounding abstract, throughout the video, you can see the music moves through him in a way where he becomes a moving piece of the art itself. Trust me, you need to see it to believe it. Possibly the most exciting part about this debut, is the change we can see in the band. They’re really not the cute, cheeky boys we knew four years ago playing for crowds of screaming girls. They’ve come into their own and for the first time, they seem to be as involved in this vision as we are. Not only is “Mama’s House” a serious jam, but it plays into the band’s journey of starting from scratch and building something they truly believe in. They’ve personally had their hands on this entire project and there’s no doubt in my mind that it will be purely, authentically Push Baby. Push Baby’s debut album is set to be released in 2019. Katy Perry Releases First Single Off New Album and Lyric Video!